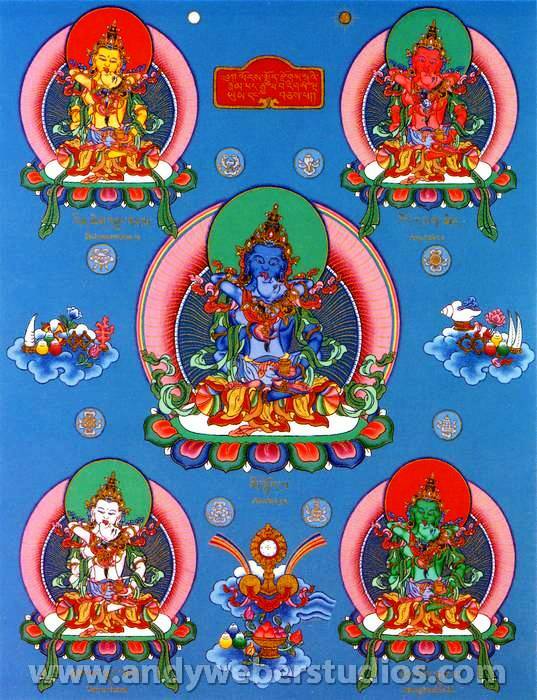 The five families (father and mother aspects) represent the manifestation of all Buddha’s purified psycho-physical aggregates, our environment and the cosmos. The fathers represent the transformation of negative energies and delusions into wisdom (enlightened attitudes), the females represent transformation of our physical internal and external world. The blue father Akshobya transforms ignorance and stupidity, his consort Vajradhatuvishvari purifies the element of space. The white father Vairochana transforms anger, his consort Lochana purifies the water element. The yellow father Ratnasambhava transforms pride, his consort Mamaki purifies the earth element. The red father Amitabha transforms passion and desire, his consort Pandaravasini purifies the fire element. The green father Amoghasiddhi transforms jealousy, his consort Samayatara purifies the air element.